In “Farewell, My Queen,” Kruger takes on her most challenging and high-profile role to date as the doomed Queen of France, Marie Antoinette. 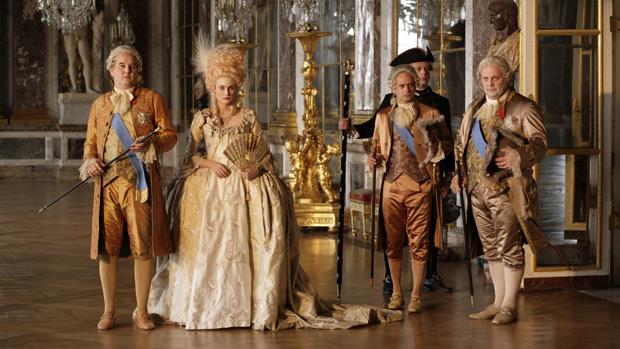 The period drama, helmed by veteran filmmaker Benoit Jacquot, depicts the final tumultous days of the Antoinette’s rule via the eyes of her official reader, Sidonie Laborde (Léa Seydoux), who harbors deep feelings for her queen. Kruger, just off from wrapping her role as The Seeker in “The Host” (based on the book by “Twilight” sensation Stephenie Meyer), sat down with Indiewire in Manhattan to discuss her take on the queen, what she has in common with Antoinette and her multicultural (and multilingual) career. So you probably get this question all the time but I have to ask it — am I right in guessing that you were no doubt terrified in taking on the iconic role? Yeah, well sure. Out of experience, I know whenever you play a historical figure, you always set yourself up for failure because people have an opinion, and feel like they know what she looked like. So it’s always a little daunting. In this particular case, I live part-time in France and she has always been cause of much debate. Some people hate her and some people think she was unjustly, you know, beheaded. So yes, it was daunting but a great challenge. I also accepted that she’s not really the lead of the movie. It’s about her, but you see only precise moments over the course of four days. The challenge was that none of the scenes were in the same sort of mood. Had it been written as a standard biopic, would you have been still interested in taking it on? I’m not sure. Maybe because of Sofia Coppola’s film [“Marie Antoinette”], it’s impossible for a filmmaker to not show his/her point of view about this person. Like in Sofia’s case, you can obviously tell that she thought she was unjustly done wrong by. So it’s hard to be neutral and I feel like it’s so much in the past that we cannot. I can’t confidently say, oh, she was a bad person or she was a good person. I think it’s so much grayer and I like that in this film it’s neutral. How did you approach the role given that Marie remains a mystery throughout? I think the book that the movie is based has a very has a very clear view of what happened in those four days. We’re not making a political observation about that time period. It’s really a precise moment, four days in her quarters, so it was more the emotional journey of her that I was interested in. You’re known for your love of fashion like Marie, and you both emigrated from a neighboring country to France at a young age. Do you see a bit of yourself in her? I don’t know if I’d call it similarity because I have no clue what it would mean to be royalty, but there were coincidences when I received the script that I thought were quite extraordinary. As you pointed out, she was from Austria which in those days was the Prussian Empire and so considered Germany. I was born in Germany, and we arrived in France pretty much at the same age. My mother’s name is Maria Terese so that was kind of strange; named after her mother. And I’m born on July 15, which is the day after Bastille Day, so I’m pretty much the same age she was when she was taken from Versailles. So there was a lot of things that came together. What made Benoit think of you for the role? I didn’t have to audition for this because that’s not how it works in France. But definitely, when I first met Benoit, I told him that he could not hire anyone else. But this one was a challenge for the language. It’s 18th-century French, which you could compare to Shakespearean English. I’ve never studied French so it was very difficult and long, long work. Tedious work to get the dialogue — the melodies are very different, and I have long chunks of dialogue. How much did the costumes and makeup help to inform the role? You don some amazing wigs. Yeah, it was fun in the beginning. So this is what happened—I guess when you first sign on, you’re like — costumes, great! You get to play dress up. They let me choose some of the fabric and design and all that is fun. But then I was really worried because some of them are very big. You go to choose the fabrics yourself? Well, not choose, like help, say maybe we should with this fabric over this fabric. So it’s a process which is great — very fun, very girly. And then I was worried they were going to be hindering, too difficult to move around in. 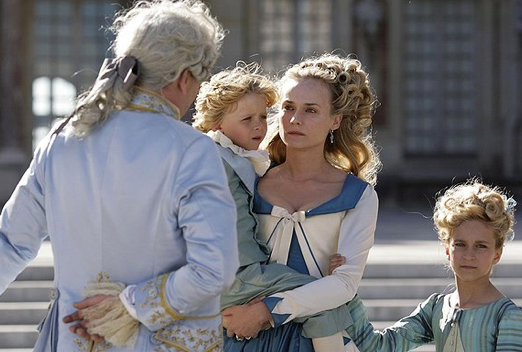 I really then came to appreciate them because it actually took each day two to three people to help me get dressed and undressed and in a way, it became my way of getting into character because that’s exactly what Marie Antoinette would have had to go through every day. So that half-hour really helped me to sort of become her. Now you are pretty synonymous with your fashion. Whenever you are written about in the trades, they always make note of the fact that you don’t have a stylist, and that you dress yourself (crazy concept). If you could would you show up at a Hollywood premiere in slacks, would you? Or do you just really enjoy the whole game of dress up, like Marie? I just don’t go about it as the celebrity media. It’s not like I say, “Oh, what am I going to wear to this red carpet?” I think a lot of people think fashion is superficial or they are scared of it. They don’t know a lot about it, which, you know, fair enough. But it’s always been (and this is not because I’m an actress), since I was a little girl, a part of who I am. It’s the first thing you see when you meet me and it’s also the first thing that you can also control. It’s about how you would like to be perceived. It’s the direct expression of who you are as a person so it’s just something that is as important to me as the book I read or the coffee I drink. It’s second nature. How much fight do you have in you as performer? With your backround as a model, did you feel the need to prove yourself as an actress when starting out? I think I’ve always wanted to have opportunities that go beyond ‘the girl’ and to be ‘the girl’ in the movie. That’s why I started out in France; I never thought I would work here. They came looking for me, basically. But it’s a challenge to push yourself. I don’t believe it matters what you look like when you want to be an actor. I think it’s about the ability to bring emotions across and be able to slip and stand behind a character where you fade away. And unfortunately or fortunately, all that only comes with experience and age because I feel I couldn’t have played this part five years ago. So things happen for a reason, but you just have to make sure you are true to yourself and don’t get caught up in the other stuff that comes with being exposed or being well known. You’ve maintained an incredibly varied career by appearing in American indies, studio films and foreign fare. What’s your approach when it comes to seeking out work? It depends. In France, it’s often director-driven because it’s such a director’s industry in Europe. In the U.S. it’s different. There are some films I really want to fight for and you go and audition and sometimes you get it and sometimes you don’t. And then sometimes stuff comes to you and you’re like, oh that sounds like fun, and that opens other doors. Unfortunately you cannot have a real career plan because you may not ever have the opportunity to follow through with any of it. You were on this year’s Cannes’ jury, which awarded the top honor to Michael Haneke’s “Amour.” It must have been a surreal two weeks for you. It was, yes. It was very… well, I have a long history with Cannes. They’ve been the first ones to notice me and they’ve been very supportive. I’ve hosted it before, so it was a great honor and it’s strange too to be on the other side. Very strange, beacuse you know yourself, how much work goes into each movie, how much passion you put into it. And then having to judge someone else’s work, or a colleague, is very bizarre. So I tried to be as kind and then at the same time real. The movies that move you the most, they reveal themselves in a way. The exchange between the jury members was a great learning process because you have directors and then you have producers and then… Jean-Paul Gautier. The exchange is very rich because everybody has a different point of view and it becomes very heated. Yes! It was very divided for sure. It’s very bizarre to give an award. It really becomes political in a way. But then, every once in a while, in the case of the Palm d’Or, in my opinion, it was just unanimous. It was one of those moments where a movie touches everybody. That’s so rare. You must be dying to work with Haneke. I’m surprised you haven’t! I would die to work with him, I really would. “Amour” is just the most beautiful movie about love I’ve ever seen. I cried I think two hours out of the two hours and seven minutes. Some movies are touched by God. Speaking of great auteurs… any reunion with Quentin Tarantino down the line? I hope so! He was shooting in New Orleans and I was shooting “The Host” as well so we had a little Basterds reunion. Oh, nice! Just the two of you? No, actually Melanie Laurent was shooting there as well but different film so she happened to be there, so it was fun. What can you tell me about your role in “The Host“? So you think, but it remains to be seen. But it was a great arc to play, it’s a really fun character. How did the production go for you? It was intense. We finished up in New Mexico with the sandstorms and the nature of it was quite a challenge. Was it nerve-wracking to embark on a project dreamed up by Stephenie Meyer, knowing that if this hits the same way as “Twilight,” you’ll be hounded? Did she tell you where she envisioned the character going? In theory, yes, a little bit. Which is helpful, but it’s not like I’m not locked in like some of the characters in “Twilight” are.